Over this past 11 months I’ve watched hundreds of women become more and more stylish on my Evolve Your Style and 7 Steps to Style Facebook groups. It’s been wonderful and so fulfilling to watch as they metamorphose and discover their styles. And what has been interesting is how often they mention that taking a selfie of their outfit each day has really helped them define their style, what does and doesn’t work and what they do and don’t love. Rather than me go on about being able to see proportions in the mirror and be able to view more objectively an outfit (as when we look in the mirror we are much more subjective and can’t see ourselves as a whole) I thought that I’d let them share in their own words what they have gained from taking photos of their outfits. It helps to have a few technological tricks up your sleeve to take those photos too – I shared mine in a blog post here. Jessie Often when I look in the mirror I focus or see only one thing. Often it is what I hope to see. When I look at the photo I see what is actually there, all of what is there. It’s like, the photo forces my eyes to take in the whole picture. (Because I’m used to seeing and taking in everything on small screens.) 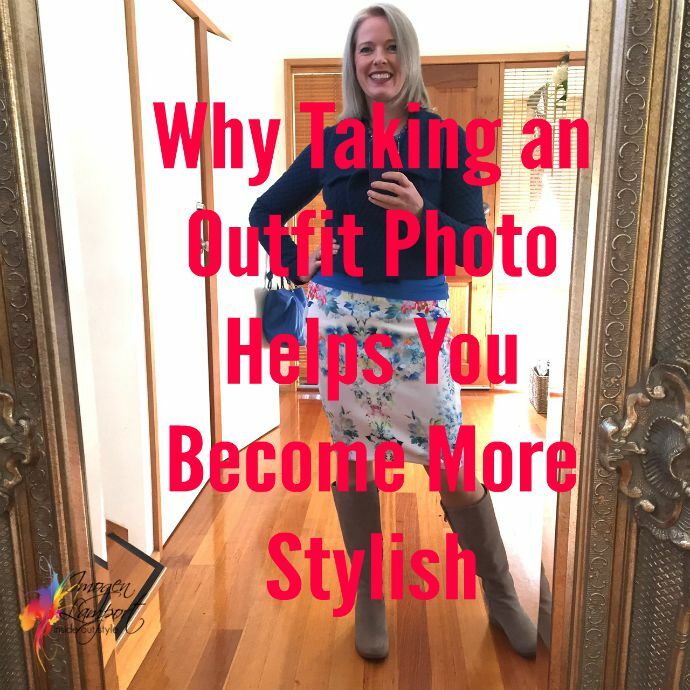 Using outfit photo’s has become an essential tool (for me) in analysing if the overall effect of the outfit actually works or not. It’s kind of like the use of the outfit photo’s is retraining my eyes to see how others see- forcing me to detach my evaluation from my feelings rather than allowing my feelings/personal response about an aspect of the outfit to swamp other information. This sounds very analytical but really what is happening is the outfit photos help me to become more balanced: I am learning how to see what works and what does not work. At the same time, my style preferences line up with my feelings. So what I need is both analytical and feelings in order to make an outfit both work and delight my heart. And that is what taking outfit photos and sharing them for honest feedback does for me. Using photos to fine tune my style in a formal outfit in line with my Enigmatic colours, clothes to suit my 8-shape and body specifics as learnt in Imogen’s teachings. Michelle For me taking outfit photos has become an integral aspect in choosing the items that play nicely together and create a flattering outfit. It also provides a useful reference so I don’t have to reinvent the wheel each time. If I can’t remember what accessories looked great with a particular skirt and top I just have a quick look. It saves so much time. And the same in a more casual outfit. The photo helped me discover a hero piece in this vest. Having discovered that my eye can be fooled when looking in the mirror the camera has become the most important tool I use to make decisions. I find I can spot much quicker what is and isn’t working in a photo. It is however important to get an accurate photo to work with, as if I don’t angle the camera correctly or stand in a flattering pose my photo won’t be of any more use than the mirror. So I did have to invest a little time and effort to learn to pose for a photo, which was something I was terrible at before reading Imogen’s articles, as my early photos are proof of. Now it comes easier and I look more natural. Looking back chronologically on the photos I can really see my style journey progress. My “look book” collection of photos is useful, and in these days of digital images, it’s just something I can refer to privately, but also have on hand whenever I need it. Katie Simply put: the mirror lies, it doesn’t tell the whole truth. TJ I would also add that the photos help when in dressing rooms and getting pressured by sales people. Sue I’ve learnt to be a lot more critical of my outfits through taking photos. Looking in the mirror, it’s easy to think an outfit is flattering. Taking photos, especially with the great feedback from the other 7 Steppers, I’m learning how to improve my outfits. I discovered though (from the latest feedback) that the photos have to be taken in the best light. The last photos that I posted of myself wearing dresses weren’t brilliant because of the way the light was shining on my tummy! lol Like Michelle, I’m starting to save photos of outfits that work well. Lynn I have started to take pics of myself with my phone and it does help to really STUDY what is going on. In the mirror, I can only bear to take a fast look. My eye rests on some part of the outfit that I like and I think I am good to go. Margaret I take photos and save them onto a private pinterest board for myself. It’s mainly to see what I’ve been wearing a lot of and how my wardrobe items fit together (are they cohesive). It also helps me identify what my wardrobe workhorses are and helps me decide what I should and shouldn’t invest in in the future. I use a tripod stand with self timer and always take photos outside with the best light available. Orsolya Beside the already mentioned effect , for me it is kind of a self-confidence building tool. Pregnancy, childbirth, breastfeeding and extreme weight gain made me ashamed of my body. I have been hiding behind the camera for over 6 yrs and there is barely any picture of me. Taking whole body outfit pictures help me get used the look of my body and accept my flaws. Ellen What everyone said, plus, when I look at a photograph of my outfit, I am able to step back and look at it less emotionally and more objectively than when I see myself in the mirror. It’s as if I’m looking at someone else. These photos really help me to find outfits I love ones that need adjustments before I road test them. Bernadette Taking a photo of an outfit has helped me “fill in the blanks” as to what was missing in a look. 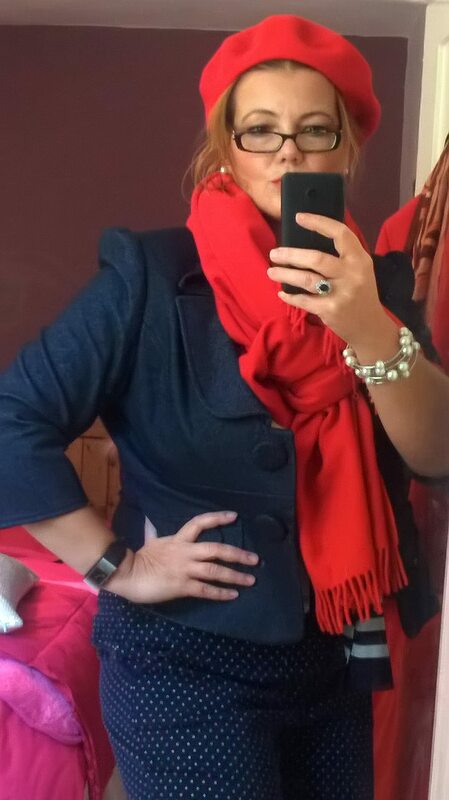 I would think I was dressed when I really needed a bracelet or a necklace with what I had on or was missing the opportunity to wear a great jacket or scarf. I never looked “polished and finished”. 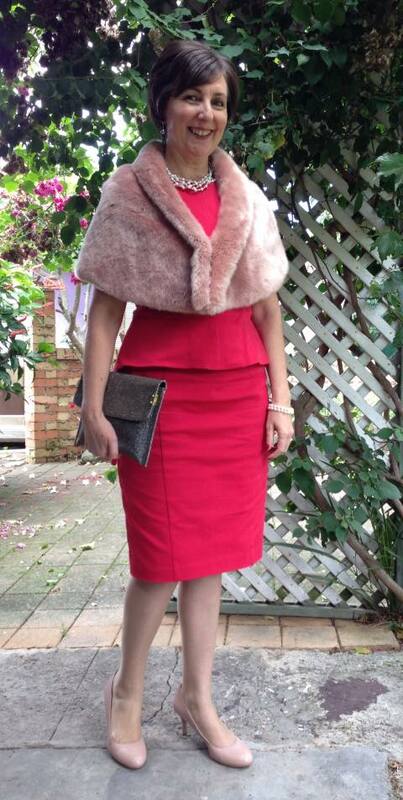 Here is one of my more successful outfits from EYS. This photo really shows what having the right color + value contrast can do for you, after having gotten loads of comments that my outfits were too dark. Also I think I was realizing at this point that red and blue were becoming signature colors for me. 2) If something is just a bit ‘off’ it can be easier to see just what’s not working – posting the photo and getting input has helped, but even just seeing the photo sometimes shows me what’s not working. Also, seeing how little makeup shows up in the photos has helped me to adjust to wearing bolder colors some of the time. Stephanie For me it has been a real catalyst to finding my style again…it may not be a style all accept, or that follows the rules of proportion and colors always, but by seeing it in the photos I can see it is me…if I only looked in the mirror not sure it would have happened. I have worn plenty of outfits I thought were pretty good and then once I see the photos, I can see what works and what doesn’t….what is truly me, fits my personality, and what doesn’t. Robin Photos allow us to be more analytical about proportion, color, fit. Photos do indeed lie, which is why Imogen gave us hints on how to post for more flattering photos. But a photo gives us time to analyze the whole in more detail that we can see while standing in front of a mirror. Moana Photos really do help as it kind of gives you a chance to look more objectively at what you are wearing When we are actually wearing the outfit we feel what we are wearing which is adding an extra sense. When we see what we are wearing in a photograph ithe visual seems to be more accurate and objective re colour, style, shape, length. 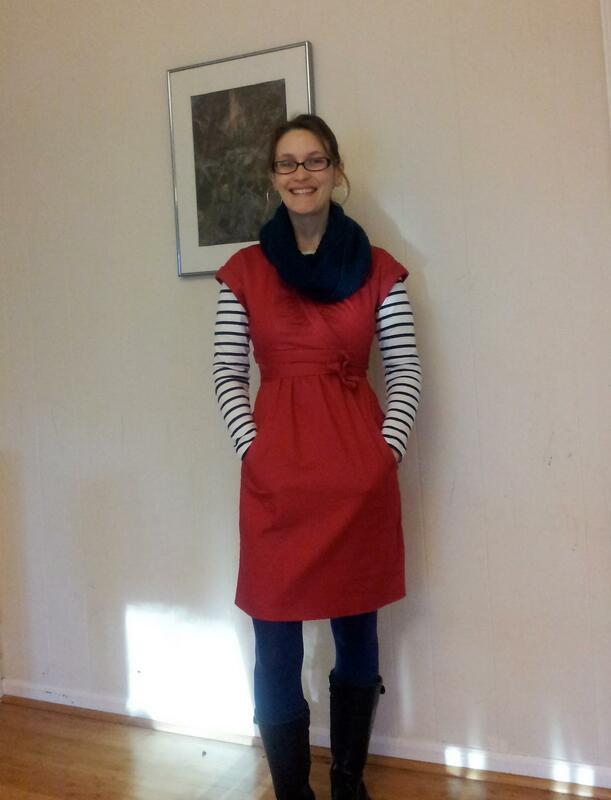 Lyndal Photos are a great way to keep track of outfits and accessories that work (and don’t!) too! Kim After getting over feeling awkward about posing in front of the camera I realised that photos give you a different perspective to that of looking in the mirror. Not sure why. Having a photo to look out gave the opportunity to take more notice of what was working and what wasn’t working in my outfits. I was shocked to find that my thoughts were often positive and not focussing on the negative aspects of my body. My confidence and awareness of my self definitely increased. That was a great outcome for me. Another advantage was the opportunity to create my own style look book for future inspirations for outfit combinations. This photograph helped me let go of something that was the right colour, and something I loved; a full length, Maxmara Cashmere winter coat. It is cosy, warm and feels sumptuous, however the pictures showed me raglan sleeves do me no favours as an hourglass shape and the coat is too big and makes me look bigger than I am. Unfortunately I think this coat is another one for the selling pile. Lucie Accountability – if you’ve taken 5 pics and you can’t get a good angle there probably isn’t one! It makes you put so much more effort in. Having a look book is so helpful in evolving my style and inspiring me to keep trying to create more great outfits like ones I’ve really enjoyed. Life is more fun in great outfits! Jelena Seeing a photo takes me straight into the analysis mode, viewing clearly and objectively and finding all the positive and less positive in an outfit. I found some pictures that made me realise how washed out something looked on me, despite the close up showing bright, rich colours. 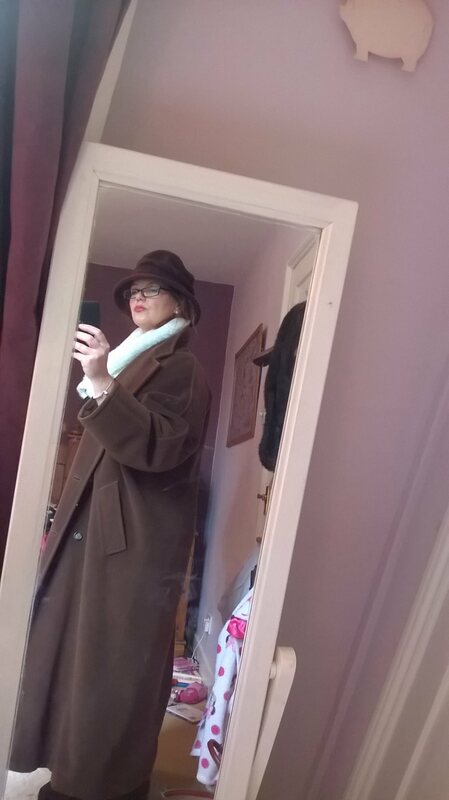 The first picture is of the fabric, which I originally thought looked like a rich, warm weave, and yet when I picked the colours out of it for accessories to make an outfit, the coat looked washed out and very muted. I had to rethink what I wore it with, and may yet sell it. I didn’t really get this from just looking in the mirror, however looking at the photographs made me realise this coat was a compromise tone for me and not a great one. Kristin When something is fantastic on me, I can’t take a bad photo from any angle. When something doesn’t work, the proof is there to see. I’ve learned what I see in the mirror is subjective and I can rationalize something bad if it meets some other desire (on trend, good price, color). Celine I have learned that make up makes me appear much more polished. I have also learned that I have pretty nice legs even though I am short. this is a picture that made me realise that red should be one of my signature colours and I was quite justified in having 5 red handbags! Do you take outfit photos? How has taking them changed what you wear and your outfits? I think that brown cashmere coat is actually pretty nice! 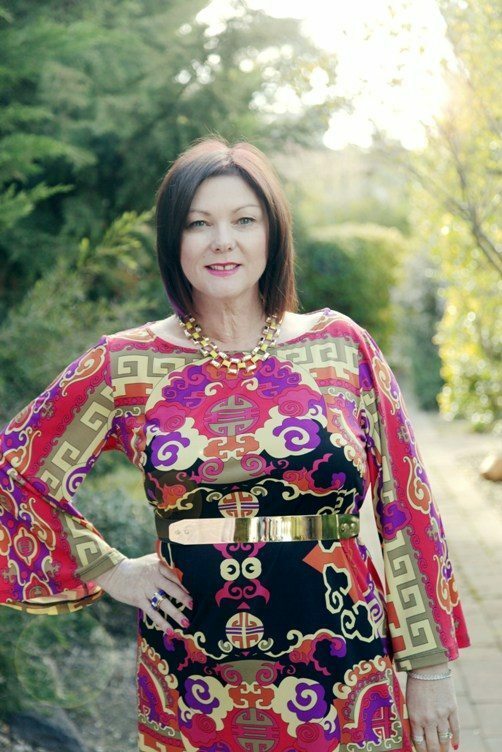 Lovely to see how ladies have got on with Evolve your Style. I would take photos of my outfits but I am not ok with the technology to put them onto the computer! Maybe my girls can teach me. Keep up the interesting work. Love your posts. 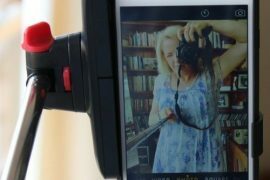 Thanks Anne – lots of people do the challenge without posting photos – but even just taking them for yourself can help you figure out what does and doesn’t work. I love this article! What a great way to assess outfits and figure out your personal style. Thank you! It’s amazing just how much it can help! I agree wholeheartedly with the photographing of your outfit concept! I am very critical of myself and always check a full length mirror before going out but have been horrified when I have seen images (photos) of myself and “what was I thinking” goes through my head. As one lady mentioned in the post, I have avoided cameras for years, which is sad because you lose a part of your history. I am on a weight loss mission at the moment and slowly but surely the extra poundage is coming off – looking good on a daily basis is a challenge. Must keep in touch re flattering poses. I inadvertently get snapped in unfortunate poses. It is sad that we let weight stop us from being in photos and losing our history! What is wrong with the brown coat?? I love it!! Maybe try it with a different scarf, but keep the coat!! Just wanted to comment before I lose the thought…Many fashion bloggers post these big photos, which are lovely in themselves. However, when I’m looking at a petite person (like me) and trying to decide whether I think her outfit works, I want to see the whole and not just the parts. What looks great in parts is often absolutely not something I would take on board once I’ve seen the whole. I even copy some photos onto my desktop to be able to see this…it’s made me stop visiting some blogs, seeing the ‘whole picture’ as it were. I have been using this exercise (aiming to do it for 28 days) and the results have been so interesting. I feel confident about my style and what I wear and this exercise has been so useful and full of ‘what was I thinking’ moments. For instance the scarf that needs to be binned due to wearing out; and what caused me to think that tying it that way worked with the overall look. Before taking photos, my friends would tell me to wear fitted tops instead of baggy tops and to wear bright lipstick. I didn’t realize, until I started taking photos, how much better I look taking their advice. Isn’t it amazing how you can start to see yourself differently through the camera lens!